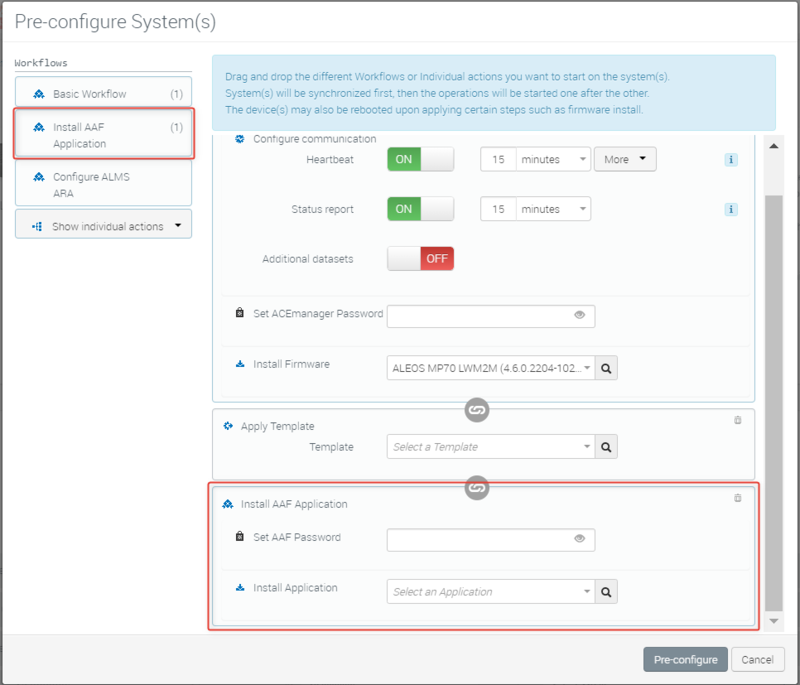 How to register AirLink Gateways for ALEOS Application Framework (AAF)? To use AAF, we advise you to upgrade to ALEOS 4.3.6 or any later version. The AAF communications between ALEOS and AirVantage are secured (encryption and mutual authentication) using a password. This password must be configured on the AirLink device and on AirVantage. Enter your device Serial Number, IMEI and optional Name, and then click Pre-configure system. On the Pre-configure System(s) screen, configure the Basic Workflow as desired. Drag the Install AAF Application workflow below the Basic Workflow. Set the AAF Password and select the application you wish to install. If you wish to set only the AAF Password for now, click Show individual actions and drag Set AAF Password below the Basic Workflow. For MSCI devices, you can provide the password when you register your gateway in AirVantage. The default password set in ALEOS is 12345 (newer gateways and routers have unique default passwords printed on the device label). After registration, we strongly recommend changing the default password.